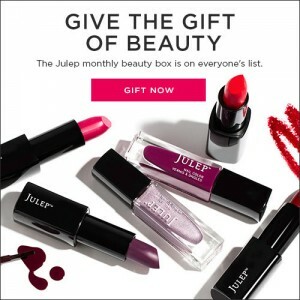 Julep Maven Give the Gift of Beauty Boxes! Julep has a great solution for that hard-to-shop for woman on your list. Spoil the beauty lovers in your life and give them the Gift of Julep Beauty Box! Julep beauty box subscribers get on-trend, gorgeous, and good-for-you beauty products delivered to their doorstep every month. Plus, subscribers get first access to new beauty collections and save 20% on any purchase on julep.com. Giving is easy: choose the number of boxes you’d like to give, enter the giftee’s contact information, and tell Julep when you’d like the giftee to receive their welcome email. Julep will let you know when she redeems her gift! The Gift of Julep Beauty Box makes the perfect gift for Mom, your bestie, the babysitter, and any beauty lover on your holiday gift list!